Do you find yourself pulling over every five minutes to check on your little one while on the road? Then you could probably use a baby car mirror. As mothers, we always put the safety of our children first. I know I’m not alone in saying this — driving with my little one always makes me feel apprehensive. There are a million things to think about! You need to focus on the road while navigating — but what about the baby on board? A baby car mirror is essential for driving mothers. Today we’re looking at the best baby car mirrors. But before we get into that, let’s find out what we need to look for. Use the links above to check the latest prices or read our in-depth baby car mirror reviews below. There are plenty of reasons why you should invest in a baby car mirror. But let’s focus on two for now. During your little one’s first few months, experts recommend that you place them rear-facing in your car. This is partly to avoid unnecessary stress caused by flashing lights. Babies, especially little ones, tend to be quickly overstimulated if exposed to too much all at once (source). This can easily occur while you’re driving, due to bright colors, noises, and even passing cars. So the best way to avoid this is to simply let them face the rear, where their only view is the back seat. But more importantly, it’s also to protect your little one in case of a crash (source). Rear-facing car seats will distribute the force of the crash across the outside of the seat. This means that there will be less impact on your little one. The AAA recommends that you keep your child in a rear-facing seat for as long as possible (source). But we all know the biggest drawback of a rear-facing car seat — we can’t see our babies! This is where the mirror steps in. A baby car mirror is a mirror that you attach to the headrest of the backseat. 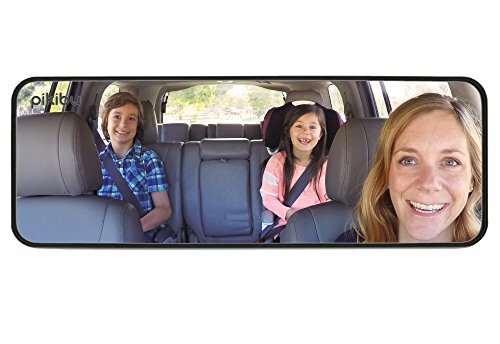 This type of mirror is a crucial accessory to buy alongside your baby’s rear-facing car seat. As you’re driving along, it allows you to quickly look in the rear-view mirror and get a good glimpse of your little one. Are Baby Car Mirrors Only for Rear-Facing Seats? No, of course not. Many parents opt to place their child facing the front after they turn two or exceed the weight and height limit for rear-facing travel. In these cases, many moms prefer to buy an additional mirror facing only their child. This is a baby car mirror that you attach to the windshield as opposed to the rear headrest. It works in the same way as a rear-view mirror, except it’s aimed at your child. There are many different baby car mirrors on the market. It’s essential that you invest in the right one and install it correctly. Buy a bad quality mirror and the only thing you’ll get from it is a lighter wallet. Crash-proof: This is probably the most important point. Most baby car mirrors are crash-proof, meaning that they won’t shatter or explode in an accident. Car headrests: Do the back seats in your car have a headrest? Most baby car mirrors require one to attach them to. Curved mirror: This is not a necessity, but a curved mirror does give you a better view. Security: You’ll need a mirror that you can secure tightly and safely. If you’re driving on a bumpy road or come to a sudden stop, you don’t want it to fall off. Clear mirror: In other words, don’t buy a cheap plastic mirror. These will quickly lose their clarity and look smudgy. 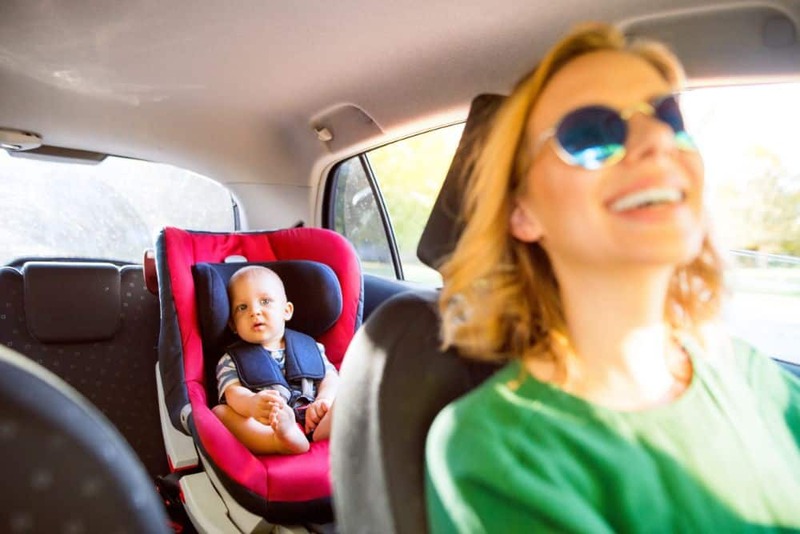 We now know why a baby car mirror is useful and, quite frankly, a necessity.And now you also have an idea of what to look for, let’s check out some mirrors! 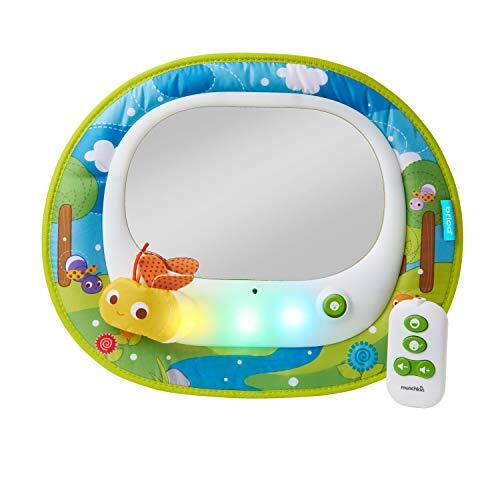 This baby car mirror from Cozy Greens is a great package. It ticks all the boxes of safety, view, and easy installment. The mirror is extra large and fitted with convex glass, giving you a complete view. Although it’s not as large as some other mirrors, install it right and you’ll see everything. Cozy Greens went the extra mile and got the mirror crash tested in Europe, where apparently the restrictions are tighter than the US. The mirror will sit firmly and safely on the headrest. Let’s talk about the deal! Alongside the mirror, you’ll also get a windshield mirror, an eBook, and a specialized cleaning cloth. The eBook is full of travel activities that will come in handy on longer trips, particularly as your baby gets older. Additionally, the mirror itself is super easy to install. It’s a mere three-step process of unpacking, strapping to the headrest, and adjusting. Will only attach to adjustable headrests. Unfortunately, sometimes baby car mirrors move out of place and require constant re-adjusting, especially if you often drive on bumpy country roads. Under these circumstances, it’s vital to have a stable baby car mirror. This mirror from Lusso Gear is just that and a little more. In order to stay in place, Lusso Gear fitted it with a double strap that clings to the backseat headrest. Even on the bumpiest of roads, the mirror will stay intact. The mirror is also one of the largest on our list. In addition, it’s curved shape will give you one of the best views of your baby. What’s more, the mirror is shatterproof, meaning you won’t have to worry about flying glass in the event of an accident. Another major plus is the sleek design. The frame of the mirror comes in three different colors, with a matte finish. However, it does require a bit of adjusting and securing when you first install it. If you skip this step, it can fall off. Requires some complicated adjusting when installing. To begin with, what we love about this Pikibu mirror is that there’s no suction needed to secure it. Pikibu attaches over your rear-view mirror. It does this using high-quality spring connectors — keeping it secure even on a bumpy road. The Pikibu mirror is wide and curved, meaning it will give you a 180-degree look at the back. In one mirror, with one look you can see all three back seats. Another plus is that it works both ways — your little ones can see you too. Additionally, it also gives you a clearer view of all your otherwise blind spots. This will improve your safety on the road. If you still have children in rear-facing car seats, however, you will need another baby mirror on the headrest facing the baby. Their reflection will then bounce back into this mirror. Gives a clear view of all the backseats and blind spots. Your children can see you as well. The plastic frame can distort on very hot days, causing the mirror to fall. You need an additional mirror for rear-facing car seats. If you’re often going on long drives, or your little one prefers some entertainment, then look no further. This Brica baby car mirror from Munchkin is the perfect travel companion. The mirror features two modes: entertainment and soothing. For each mode, you’ll get four different tunes. These are then synced with LED lights that display an entertaining light show. What we love the most is that mom is in control from the front seat. You’ll get a remote, which you can use from the driver’s seat and thereby control everything. 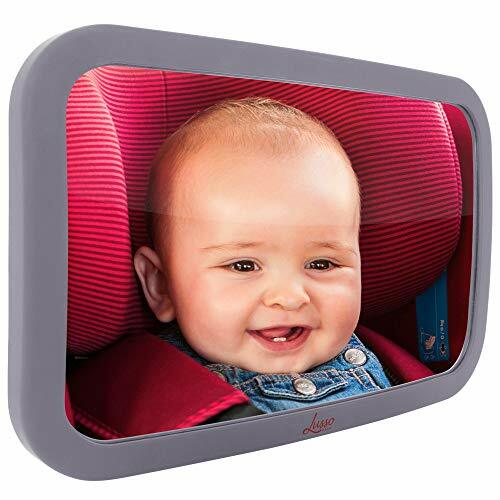 The mirror is also crash tested, so it’s completely secure and safe to keep near your little one. However, if the headrests in your car are fixed, then you won’t be able to attach it. Great entertainment for babies and mommies. Not for cars with fixed headrests. Might get a little too distracting. 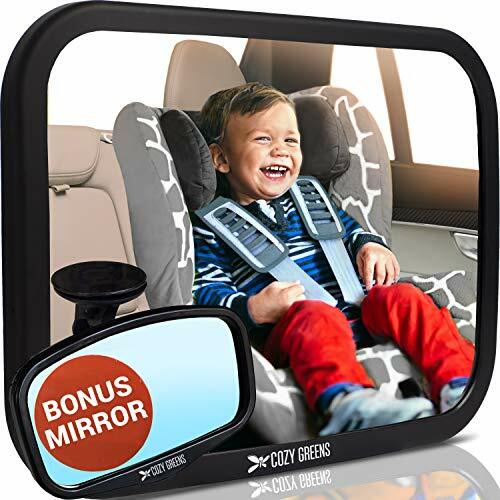 If your toddler is now transitioning to a front-facing car seat, then this mirror from Ideapro is for you. 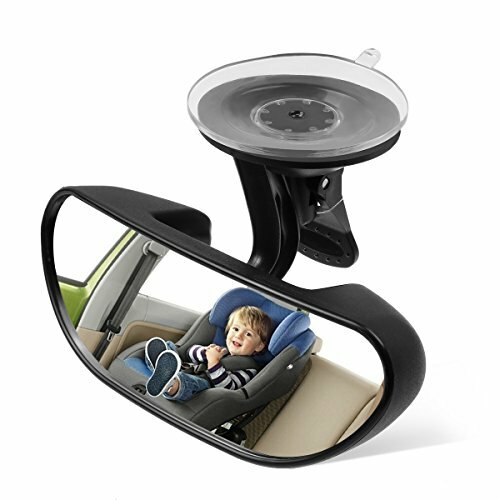 This mirror will be your rear-view co-captain, helping you get a quick view of your toddler. It will give you a clear view with a size of 5.9 inches by 3.93 inches. One feature that we love is the strong suction. Baby car mirrors with suction cups often have a tendency to fall off, no matter what you do. Fortunately, Ideapro made sure that wouldn’t happen. Once the mirror is up, you can rotate it quickly and easily, to get a good look at your toddler. That said, it doesn’t stick well to surfaces other than glass, and it’s not useful if your baby is still in a rear-facing car seat. Gives a good view of the backseat. Not good for rear-facing seats. Baby car mirrors are essential, especially for rear-facing car seats. They’ll let you see your baby at a glance, without the need to pull over and check. But it’s important to buy one that’s secure, shatterproof, and gives you a clear view. This is why my favorite is the Cozy Greens baby car mirror. It’s crash tested and crystal clear, plus you’ll get a few extras that can help on your trip. Do you have a favorite baby car mirror? Feel free to let us know in the comments below. We hope that you enjoyed our article and please share if you did.